Every five years or so, local transit leaders come together and celebrate the opening of a new branch to Portland’s ever-expanding light rail system. This go around, however, will take a few more years than usual to come to fruition. The Southwest Corridor has waited a long time for its turn in the mass transit spotlight, which it is in right now as the project is nearing completion of the long and arduous public refinement process. After the locally preferred alternative is chosen, that alignment will then head into the environmental impact phase before it can start applying for local, state, and federal funding grants. Having been on the planning map well before the first Blue Line train arrived at Pioneer Courthouse Square back in 1986, this proposed commuter service will extend the Green Line from Portland State University to Tigard and Tualatin by roughly 2025. 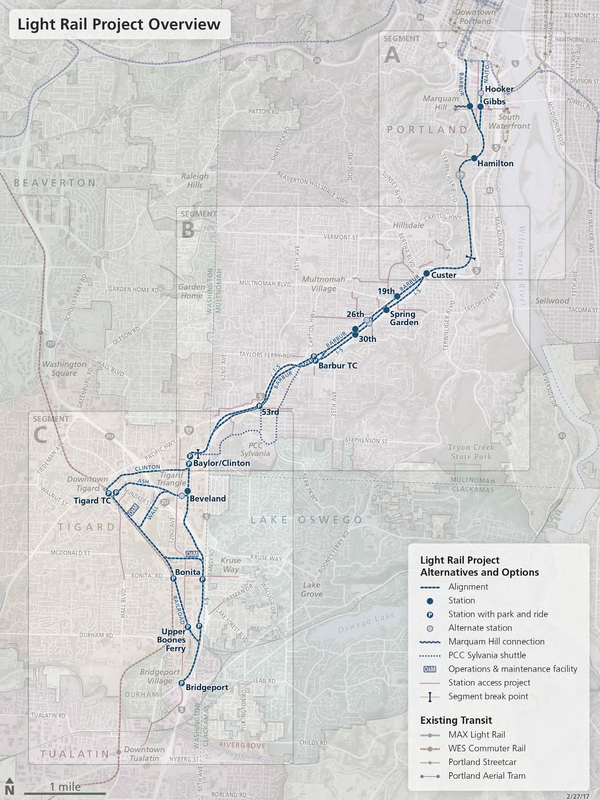 The Portland-Milwaukie Orange Line, which opened in 2015, was the latest extension to go into service, and the Columbia River Crossing’s Yellow Line extension was supposed to be the 5-year stop-gap rail project, being proposed to open around 2020 before the entire project was ingloriously dispatched in 2013 (albeit its corpse has recently been resurrected). The social, political, and economic changes of the last decade have directly effected long-term transportation planning, with Portland proper taking a step back from large capital rail projects and focusing more on pragmatic and cost-effective bicycle and pedestrian improvements coupled with long-neglected street maintenance. 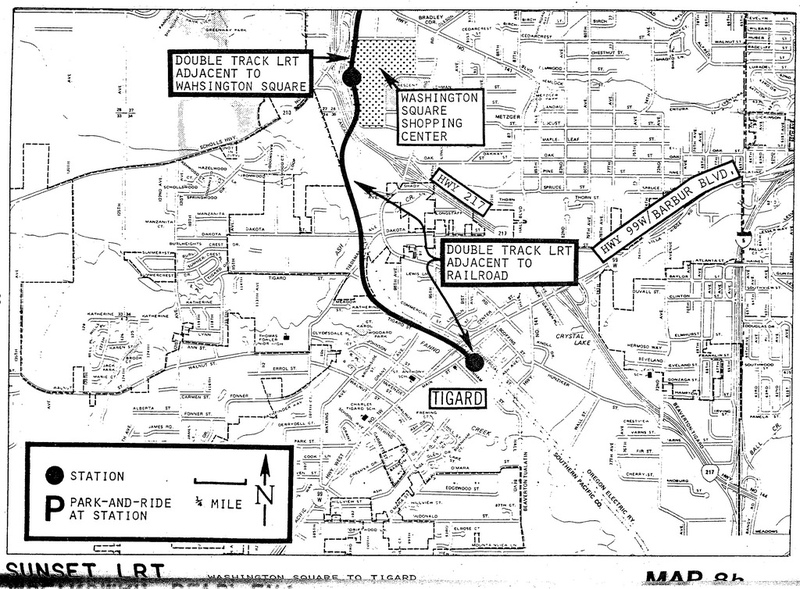 While there are some whispers of a new Portland Streetcar line now and again(pdf), nothing much has actually happened since the completion of the loop and the failure of the Portland-Lake Oswego Project to get off the ground, a project that would have brought rail transportation to the south/ southwest of Portland. At the state level, the Oregon Department of Transportation has also throttled back their own aspirations after actively pushing for a Willamette Valley high-speed rail line, another project focused on rail transportation to the south/ southwest of Portland. The steering committee chose a preferred alternative that is nothing more than basic track upgrades to the existing privately-owned and heavily freight-trafficked route. There were some great options on the table for the Oregon Passenger Rail project; including one that called for a new dedicated high-speed rail right-of-way along I-5 (pdf), and another that would have re-electrified (pdf) and repurposed the currently underutilized Oregon Electric Railway. That state run project ended on a particular sour note with rail advocates when in late 2015 the project team used statistical sleight of hand (see How to Lie with Statistics) to effectively make the project cost nearly six times more weighted than any of the other five project goals (including multiplying cost by itself). This was done in order to justify their preferred alternative even though the two aforementioned options got better overall scores as defined by the project goals themselves. If Oregon had not been permanently sabotaged by Sizemore’s multiple tax-breaks-for-the-rich-disguised-as-tax-breaks-for-the-poor measures back in the 90’s, long-term public investments like this one would probably be more palatable to state agencies. Metro, on the other hand, has seen the quantitative effects of non-highway public infrastructure investments over the long term, and has continued to cobble together what little funds they can find in order to realize the region’s long held transportation vision. Last year there was a minor setback with the Powell-Division Project Metro spearheaded, after their partner agency Trimet came back with some unfortunate news about reduced travel times, which caused the entire Bus Rapid Transit project to be reevaluated and rerouted. The Southwest Corridor Plan’s steering committee have learned from the now-rebranded Division Transit Project’s pitfalls and associated lower levels of public support, and have moved away from BRT to focus solely on light rail as the primary transit component. The Southwest Corridor project is more than just another light rail line to add to Trimet’s collection, however, as it will also include ancillary upgrades to walking, biking, and automobile infrastructure as well as coordinated land-use planning and zoning changes. This multi-model and multi-disciplinary approach makes for a more inclusive transportation project, but it also creates layers of compromises and balloons the relative costs associated with rail transit development. Regardless, the project is a worthwhile undertaking, and will help connect some of the region’s most topographically-challenged suburbs with the city center. The most recent plans have whittled down the myriad of potential possibilities into a short list of semi-reasonable alternatives, alternatives that are further broken down into three smaller, more digestible sections. Tunnels, once seen as a necessary component of any alignment through the dense and winding hills, have all been eliminated from further study despite their prior success with the twin-bored underground segment of the Blue Line. 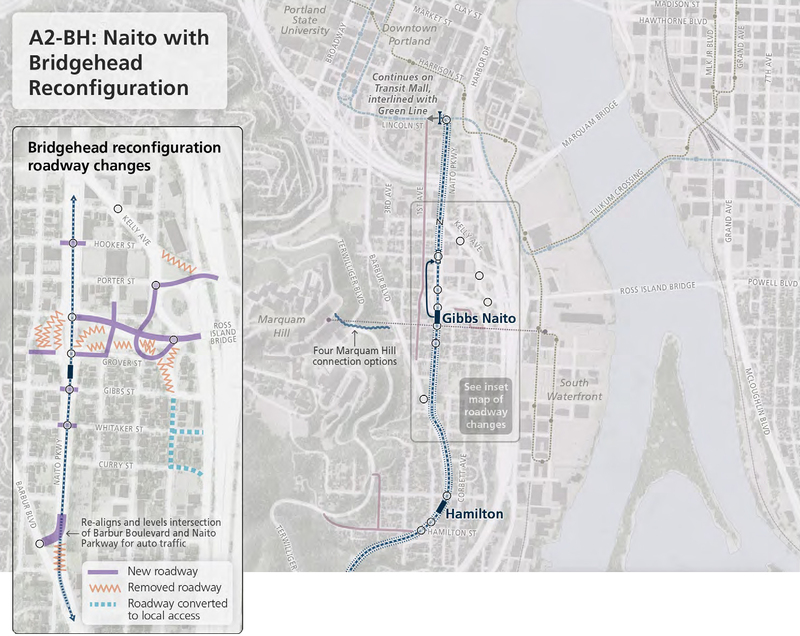 The first section of the Southwest Corridor could have easily been almost entirely underground, quickly and directly serving OHSU and Hillsdale, but unproven concerns over cost escalation and construction impacts killed that popular idea in committee. What was chosen instead could potentially be the most expensive and most impactful aspect of the entire project. 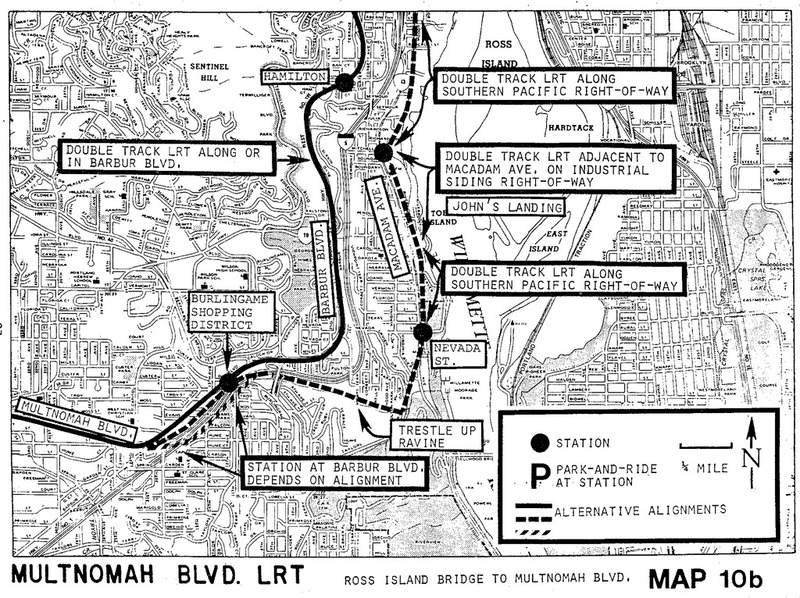 The first segment focuses on the short stretch from the downtown transit mall to just before the Terwilliger curves, an area that was originally developed by the Red Electric and Oregon Electric interurban lines before they were eventually paved over as Barbur Boulevard and I-5 respectively. 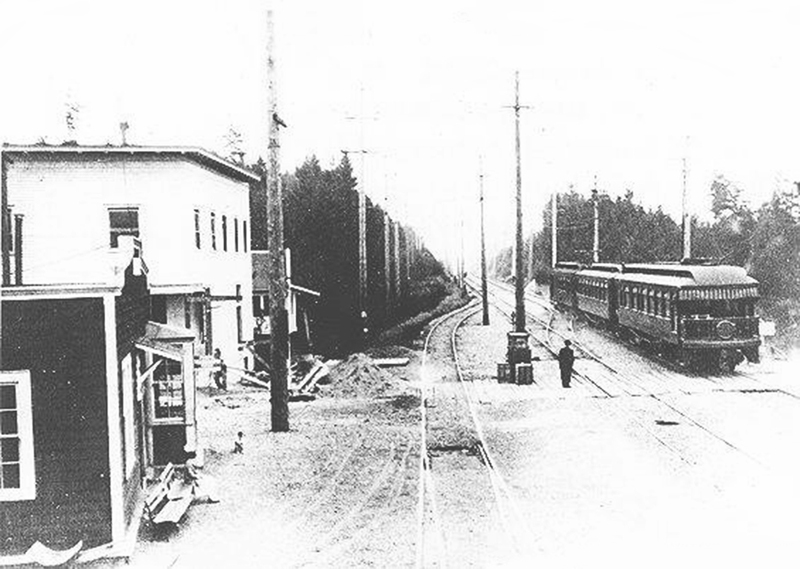 There are two primary alignments through this section; one following along the old railroad grade that is now Barbur Boulevard and 4th Avenue (the Red Electric line that once terminated at Union Station), and another which turns off of SW Lincoln to Naito Parkway before joining Barbur Boulevard for the remaining journey southward. The latter would require some pretty major modifications to the Ross Island Bridge approach, a project that has been on local, state, and federal radars as a high-priority area for quite some time now. The surrounding Lair Hill neighborhood wants to use the Southwest Corridor project as a catalyst to revive their long-held dream of reconnecting their civic streets and calming the automobile-dominated landscape that exists today. The city is in favor of leveraging their dollars to this respect, hoping to get their federally-funded cake and eat it too. 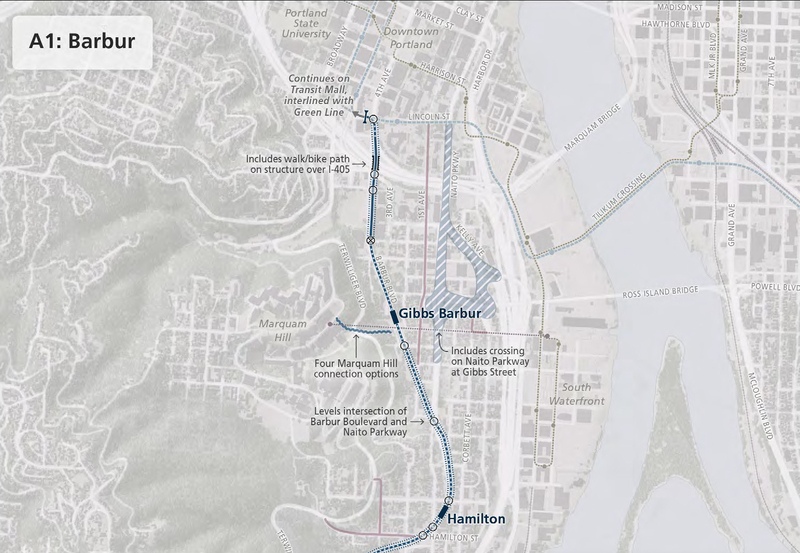 If the old Red Electric route is chosen for the first section of the Southwest Corridor, known as option A1, the neighborhood will remain mostly untouched, except for the proposed ADA accessible connection to OHSU, which will require some land acquisitions. The more intrusive option would put the new light rail tracks down the center of Naito Parkway from Barbur, which would require the complete reconstruction of several Harbor Drive Freeway era overpasses and on-ramps to the Ross Island Bridge. This option, known as A2 (BridgeHead) would drastically alter the neighborhood to a more pre-war state, reconnecting the grid and removing a lot of through traffic from local streets. This option is a welcome one, but its added costs and complications put it on par or more expensive than the previously dismissed tunnel options. Almost everyone can agree, however, that the outdated mishmash of commuter driving lanes needs some attention whether the Southwest Corridor addresses it or not. The mid-section of the proposed alignment is not as cleanly dissected into two options as the first segment. 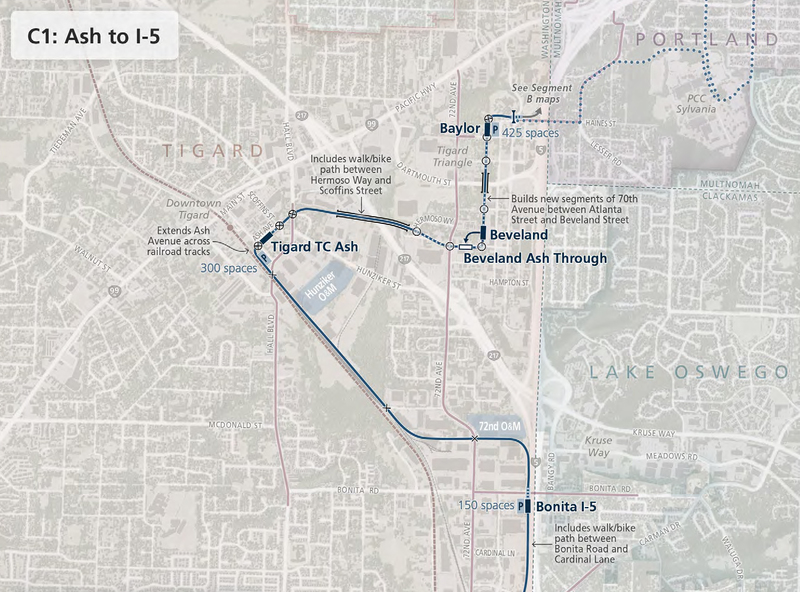 This part will either run down the middle of Barbur Boulevard like the Yellow Line on Interstate, parallel I-5 like the Banfield Blue Line, or some combination thereof. This segment would probably better be served via full grade separation, but those options are primarily off the table. Any surface alignment would require land acquisitions and/or reduced auto capacity, neither of which is an exciting prospect to those who would be impacted by it. In the end, a primarily Barbur alignment with an elevated section over the nefarious Capitol Hwy/ Barbur/ I-5 crossing will probably prevail as it will cause the least disruption to the existing suburban fabric. While parts of this section were created during the interurban age, the grand majority of the existing development is automobile dependant, spread out, and low density. If the project is built, the middle section will more than likely see redevelopment that is similar to Interstate Avenue, redevelopment that is both slow and underwhelming design-wise. The last segment of the project has the most options available to it. In fact, this section could, in the end, become two separate branched lines. The single-line series of options, known as C1 through C4, are all variations of the same general concept: bring mass transit and street improvements to the Tigard Triangle, connect to WES in downtown Tigard, and then continue on to a terminus at the Bridgeport Village faux-urban shopping mall. These options also include alternative locations for a new operations and maintenance facility similar to Elmonica and Ruby Junction. All of these options are operationally realizable, but the C4 alternative has the least out-of-direction travel while also creating a new public accessway in the downtown part of Tigard. 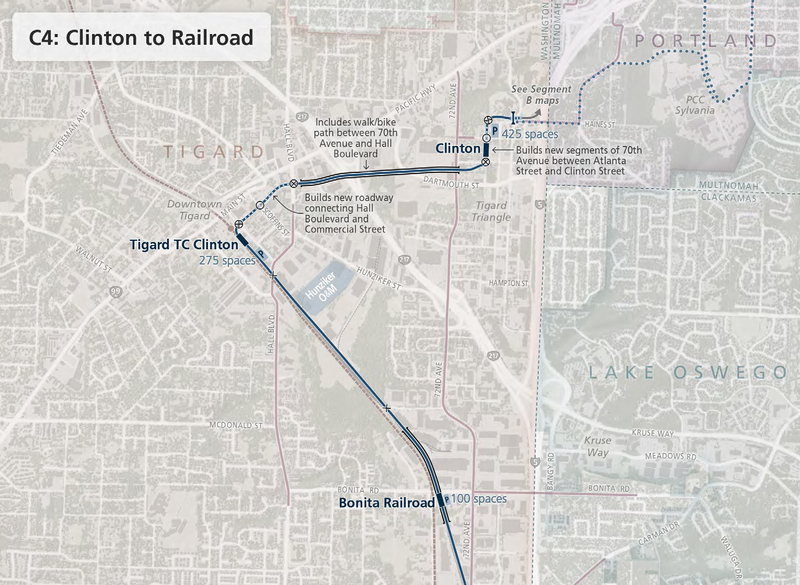 There are powerful interests in the Tigard Triangle, however, who want to utilize the MAX extension to bolster the area’s urban renewal program, which may tip the scales toward options C1 or C2 (similar to C1, but with railroad alignment to Tualatin). The branch options for this segment are much more interesting. The first item of note is that this proposal is for a branched service, something Trimet has never liked to do for operations reasons, yet could be the happy medium between the linearness of light rail and the diffused serviceability of BRT. 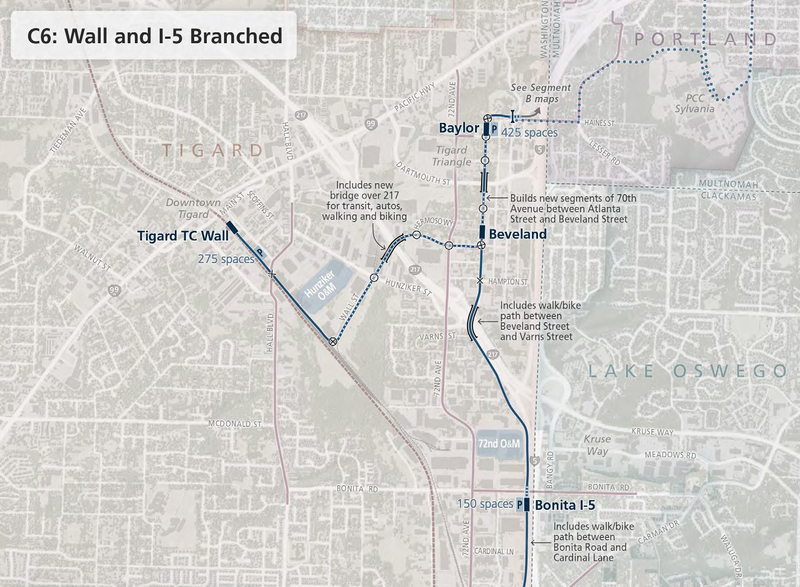 Both options have a straight shot approach to getting from Barbur Boulevard to Tualatin via two Tigard Triangle stops, and both will offer practically identical service schedules. The main difference is how the downtown Tigard extension ends, more specifically, what direction it faces when it ends. This is very important because each option precludes a different future expansion opportunity; C5 ends facing south which could eventually expand out toward King City and Sherwood, and C6 terminates facing north toward a potential Washington Square extension. 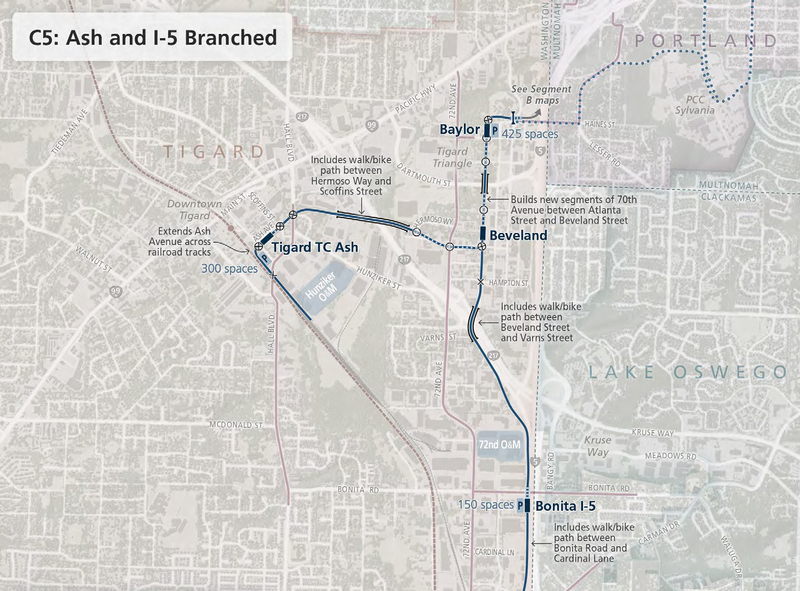 All options could be extended to Tualatin proper and either Wilsonville or Sherwood, but the branch line configuration opens up the operational possibility of serving more than one endpoint while simultaneously creating the perception that a future expansion is already envisioned. By Trimet’s own account, the branched configuration would create the need for better service because of their own 15-minute headways rule. This would end up costing the transit agency more for operations, of course, but it would also increase ridership and off-peak waiting times for the first two segments. It would also be a great marketing choice, getting two lines for the price of one sounds pretty good in this age of scarce resources and pluralistic priorities. If this branching option is interesting to you, the next steering committee meeting will be covering the ins and outs of it next Monday, May 9th. While the region’s focus is on the southwestern suburbs has its many merits, and good merits at that, it is a shame that the elephant on the other side of the room, the city-formally-known-as-Damascus, hasn’t been made more of a priority for mass transit infrastructure. The area is still in the Urban Growth Boundary, but is now unincorporated Clackamas County without a masterpan. Development will slowly erode the pastoral farms and forest lands with cul-de-sacs and strip malls without a unified vision for accessibility, livability, or urbanity. The piecemeal approach of auto-oriented free-for-all has had devastating effects on the region’s suburbs from the 1970’s through the 90’s. If transit was introduced now as a development tool, like a legacy system, instead of as an afterthought, like the Southwest Corridor, then the whole area could develop densely in a more organic and genuine way. Development is supposed to pay for itself, but it often doesn’t, and what does end up getting built is usually subsidized highway projects disguised as freight improvements. A new public transit project, on the other hand, could be paid for by targeted value capture. Digging even deeper, the former urban reserve that was once Damascus should never have been added to the UGB to begin with without working out the details beforehand. There was an overwhelming pushback from longtime local residents and business owners who still want to preserve their way of life, as they should, and that could have been taken more into account since there are other areas adjacent to the metropolitan region who actually wanted the ability to develop. Besides, the less the UGB is expanded the better off everyone is in the longest term; for there is a finite amount of land in the world, and once it’s built on, it’s very hard to unbuild. Informative account, but there are two issues about the proposed OHSU/Hillsdale tunnel that I don’t think were taken into consideration. The first was that it was opposed by OHSU and that it was not popular outside of Hillsdale. The second is that the neighborhoods immediately to the south of downtown (both lair hill and homestead) have long suffered at the expense of Hillsdale. Those neighborhoods bore the brunt of misguided 60’s destruction of south Portland, losing civic institutions (such as the local library branch) to Hillsdale, while being degraded by traffic from Hillsdale and points south. Routing the SW corridor underground to Hillsdale would represent another investment in that suburb while not dealing with the many trafffic issues caused by poor planning in closer in neighborhoods.